Pomegranate season is in full swing, and I couldn’t be happier. I mean, how can you not smile when looking at these beautiful ruby red gems? What a perfect way to brighten these dreary, gray fall days. Pomegranates have appeared in full force in all the local grocery stores, and I was more than happy to shell out a few dollars to bring a couple home with me. Sure, it takes a little bit of time to extract all those little juicy arils, but I find the whole process very zen and relaxing. Spend a little time one evening breaking down a whole fruit, and you have arils ready to go throughout the week. Not only are they pretty to look at, but pomegranates have some great things going for them. A 100 g serving (just over 1/2 cup) has a mere 83 kcal, and provides 4 g of fibre. 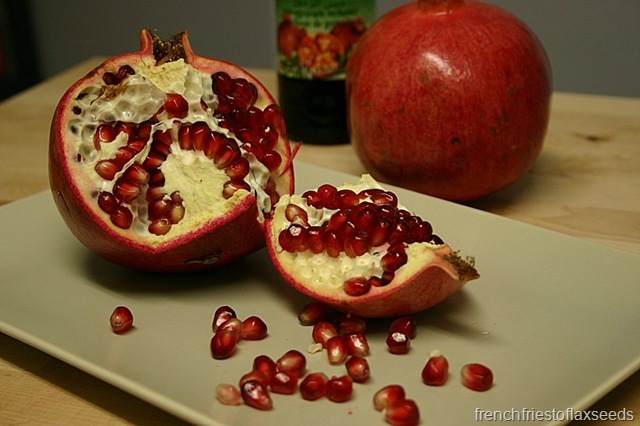 Pomegranates also offer vitamin C and potassium, and like other richly coloured fruits, some powerful antioxidants. Because of this, research has been looking at their impact on a variety of health conditions, including heart disease, prostate cancer, diabetes, and even the common cold. My favourite way to eat pomegranate seeds is simply as they are – they make a great snack to pop in your mouth, with the tangy burst of the fruit and the little crunch of the seeds inside. And yes, you can eat the seeds – that’s where all the fibre is! 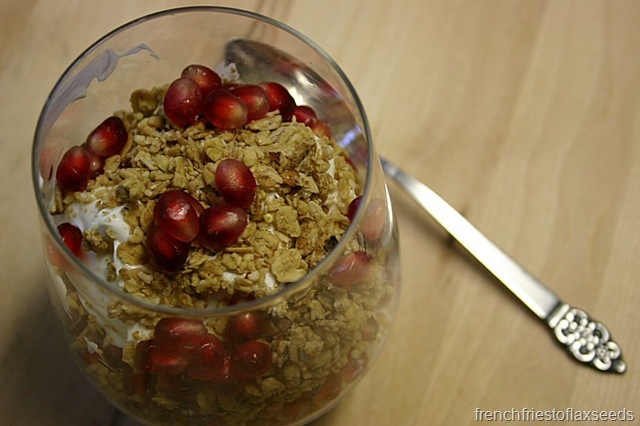 Of course, you can also add the arils to yogurt with some granola, sprinkle them on a salad, top your morning oatmeal, or bake them into some muffins. 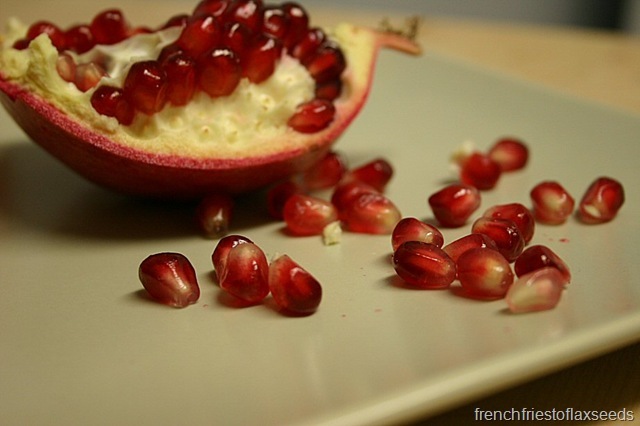 If you’ve never tried pomegranate, don’t let it’s thick, uninviting exterior deter you. There is a great tutorial on how to open up a pomegranate on the POM Wonderful website, as well as tips on how to pick a good fruit, and a ton of recipes to inspire you in the kitchen. So go pick up a fruit and enjoy while they are still around! 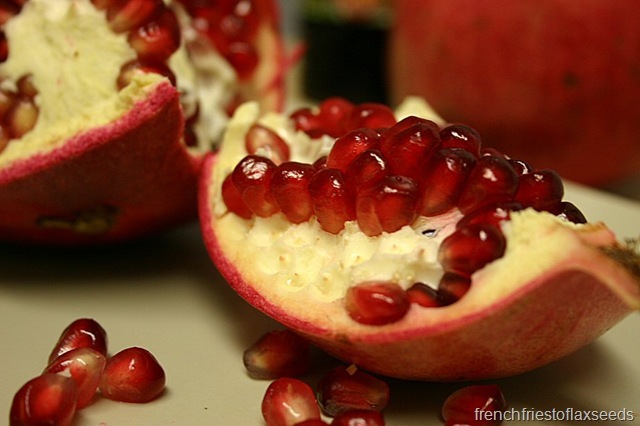 Do you have a favourite pomegranate recipe? Please share!